TRUMP BLASTS STEPHANOPOULOS FOR NOT REVEALING HIS CLINTON TIES! Republican presidential nominee Donald Trump went on with former Clinton advisor George Stephanopoulos on Friday morning. 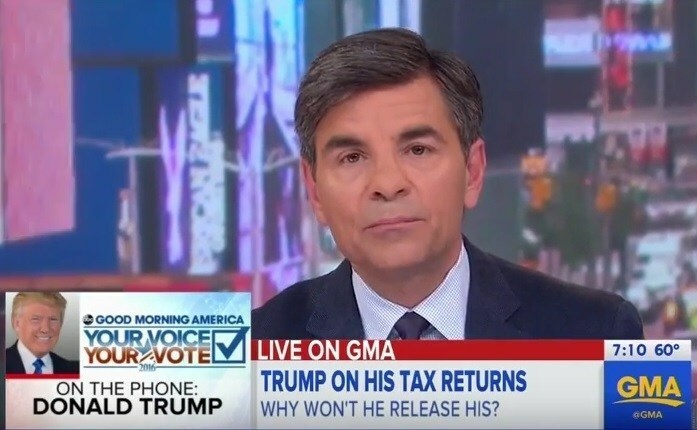 George Stephanopoulos: You said you’d release your tax returns when Hillary has turned over all of the emails in her possession. Donald Trump: She didn’t turn them over. There are plenty missing. I read yesterday where there are a lot of emails missing. I know she’s a good friend of yours and I know that you worked for her and you didn’t reveal it but you know she did not turn over her emails. There are a lot of emails missing. Stephanopoulos: There are emails from her staffers missing. She turned over all of her emails. Trump: There are emails missing all over the place. Hillary deleted 30,000 emails telling officials they were her personal correspondence.